--the renowned Whippet Therapy Dog "Willow", noted for her ability to comfort the sickest children. Linda Solano photo. Whippets from all backgrounds have been increasingly put to very special uses by people who enjoy training their companion dogs to be therapy dogs for people with terminal illnesses, disabilities, and handicaps. With their calm nature and innate desire to snuggle up and provide a living hot water bottle to any human who seems to need one, they are a good fit for Therapy Dog applications, and with their usually unreactive nature, they adapt well to people whose body language or medical equipment might be weird or frightening to dogs in general. They also love to lay on soft cushions and be stroked for hours, which makes them natural fits for the READ programs in schools. Whippets make great therapy dogs! Why? Well, from a practical point they are short haired and easy to groom, bathe,and prepare for visits. Their moderate size makes them easy to lift on a bed or over a bed table for easy access to patients. Whippets seem to be very in tune with humans and willing to snuggle with patients who need a quiet visit, or retrieve a ball or play games with someone who needs a bit more active time. They are willing to stretch out along a sore body and provide great body heat or curl up in a tiny ball if bed space is limited. Whippets are used in READ programs, hospice centers, some intensive care units, rehabilitation units, with psychiatric patients,and for care programs and cancer camps among others. The first AKC winner of the ACE award was Willow the whippet who worked at the National Institutes of Health in Washington D.C In her honor, the American Whippet Club honors the whippets volunteering each year with the privately-sponsored Willow Award, the winner of which each year is announced at the AWC National Specialty Awards Banquet. 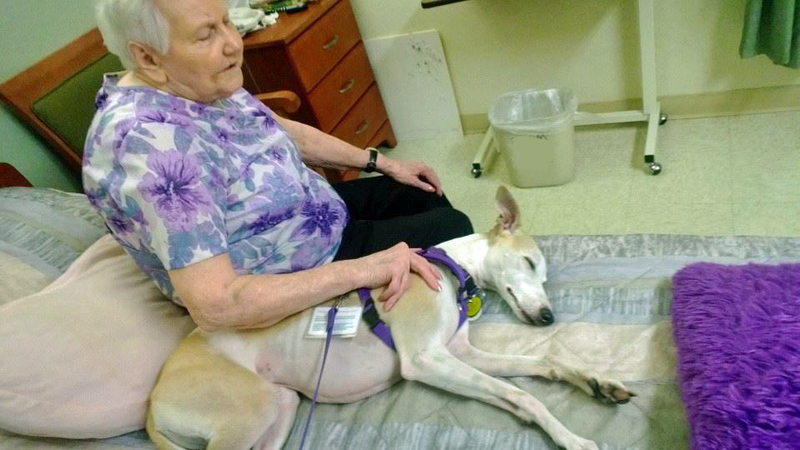 -Vickie Carter's Whippet "Phizz" at work brightening the day of an elderly assisted living resident. The card in the plastic sleeve is the credential that shows this dog has completed training, been certified, and registered with one of the therapy/service dog organizations. Many facilities require proof of certification in order to accept visits from therapy dogs. Along with working with cancer patients, and the elderly in hospice and memory care, the READ program is very conducive to the Whippet's ability to just provide a soothing and pleasant companionable presence. 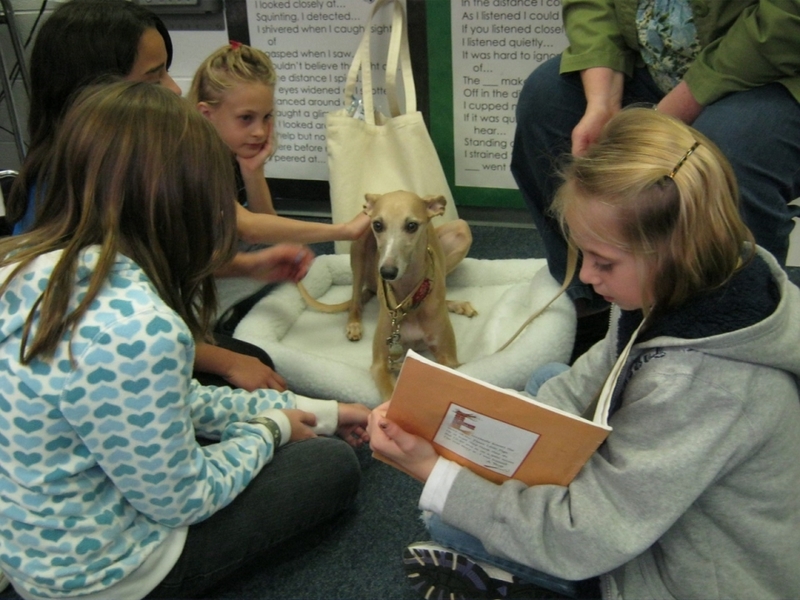 Children too shy to read to adults often enjoy honing their skills reading to dogs, and Whippets have proven their worth in this program. --"Tangie" is quiet and attentive while a group of youngsters practices reading skills. There are three categories into which dogs who are of help to people either with their psychological or physical needs fall--Therapy Dogs, Service Dogs, and Emotional Support Dogs. All three categories are very important roles that are admirably filled by many breeds and mixes, not just Whippets, but it is important to draw the distinctions between them. A Therapy Dog is different from an Emotional Support Dog or a Service Dog. While many people find their pets provide them with comfort and prevent anxiety and panic attacks, a Therapy Dog is trained and certified to be safe and stable in a variety of environments outside the home with people who are not the owner. A Therapy Dog is calm and under the control of their owner in the presence of people who might behave in erratic or unusual ways, or have medical equipment that is loud, bulky, or makes unusual sounds. Hospitalized, bedridden people often smell "different" to dogs and this can be upsetting to dogs who lack training and socialization to those who have terminal cancer or other serious illnesses. Therapy Dogs are therefore trained to benefit the needs of people other than their owner. Therapy Dogs undergo training and certification to show that they will make stable, friendly theraputic visitors to people they do not know who are suffering from a variety of medical and psychiatric conditions, or who would benefit from a therapy dog to help with their rehabilitation or socialiation. Whippets make excellent Therapy Dogs and many have achieved the certifications which allow them to wear credentials into medical units or assisted living and memory care facilities so that they can brighten the lives of people who are experiencing disease, age-related decline, or disability. A Therapy Dog also differs from a Service Dog. A Service Dog is a dog trained to provide a particular service to a handicapped person or one with a medical condition that a dog can assist with so that that person can live a more active or interactive life outside their home or within (example: Seeing Eye Dog or Hearing Ear Dog that alerts a deaf owner to phone calls or doorbells). Few Whippets qualify as trained Service Dogs, but there are some rare examples of Whippets who have shown ability in certain areas. Some service dogs are so in tune with their owners that they are able to alert their owners to drops in blood sugar or the onset of an epileptic seizure, so that the owner can take proactive measures to forestall a potential crisis. An Emotional Support Dog is a dog which provides emotional and psychological support to the owner. The value of dog ownership to promote social interaction and greater feelings of emotional stability and well-being is now proven by many scientific studies, and with their devoted nature and calm indoor disposition, a Whippet is very often able to become an outstanding Emotional Support Dog to a person who suffers from social anxiety or depression. Whippets further provide a social outlet for many people given their overall versatility. Whippet owners often find a path to making new friends through involvement in the many activities open to Whippets. For more information about Therapy Dogs and Therapy Dog training and certification, go HERE. For information on the READ program, go HERE. Have a Therapy Whippet or know one and want to nominate it for a Willow Award? Go HERE.